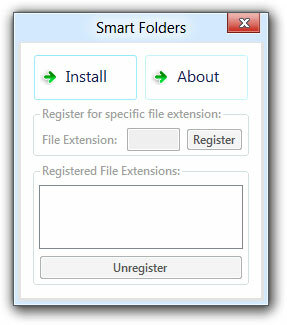 Smart Folders is a free tool for Windows that allows users to create a folder just by dragging files/file over another file. It provides the same folder creation functionality that is present in iOS and Android for saving time. Run the installer and click the Install button. The app will now install and register itself for all extensions. But Windows and some other apps have already registered themselves for specific file extensions like .exe, .bat, .lnk etc. To register the app for specific file extensions, type the extension in the text box near File Extension and click Register. 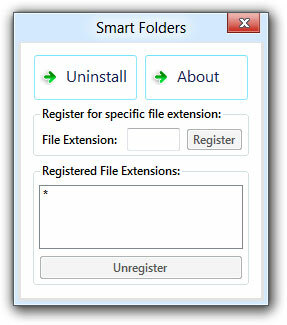 To unregister the app for a specific file extension, select the extension in the Registered File Extensions list and click Unregister. Just type a name and click OK or press enter. If you click Cancel or type a blank name, the app will name the folder like Folder 1, Folder 2 etc. To uninstall the app, run the installer again and click the Uninstall button. The app will unregister itself for all file extensions and uninstall itself.